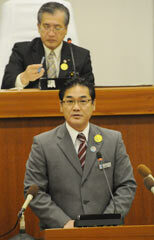 At the Ginowan City Council on March 1, Ginowan Mayor Atsushi Sakima delivered a policy speech. On March 1, the Ginowan City Council held its regular meeting for March 2012. In his policy speech, newly-elected Ginowan mayor, Atsushi Sakima, voiced his opposition to the deployment of the MV-22 Osprey vertical take-off and landing transport aircraft to the U.S. Marine Corps Air Station Futenma, saying, “I would like to work together with the City Council and relevant organizations to oppose the deployment of the Osprey by holding protest rallies.” It is the first time that Sakima has clearly stated that he would hold rallies against the deployment of the Osprey aircraft to Futenma Air Station.